Precision Sheet Metal - Vista Industrial Products, Inc. Precision sheet metal is the fabrication of metal sheet requiring specific dimensions while holding a tolerance. A tolerance is the range for a dimension. This is annotated on a print. Precision is tolerance in the sheet metal and machining industry. A mundane example would be the required length for a part being 25 +/-.25 inches. The +/- .25 is the tolerance. This means the part can be 24.75 to 25.25 inches. 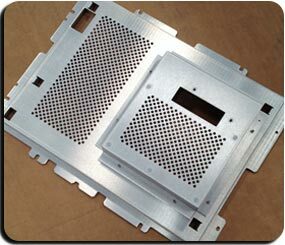 Sheet metal tolerances can be found in the manufacturing engineering section of our website. Vista Industrial Products, Inc. fabricates parts to print. So if your company prints have the exact materials, dimensions, tolerances, and any other special requirements, VIP will be more than happy to review your prints for manufacturability. We thrive on large packages, so if your part or project has many prints in a package, then it will be reviewed by our Manufacturing Engineering Department for Value Added Manufacturability. We are also known for our quality in the precision sheet metal fabrication world of Southern California. A rule of thumb is the closer the tolerances, the higher the cost. This is a general rule, but there are many other variables involved when estimating a metal part. VIP has an in-house Estimating Department. We also have a sheet metal tolerance sheet which engineers can reference when engineering parts to sheet metal tolerances. It is important to keep in mind that sheet metal tolerances are different from machining tolerances. This is a common mistake with new engineers, and one we see often. We will catch this error and hope you are open for suggestions. Over the past 50 years, we have worked with numerous industries that require sheet metal. Some of our current customers include those in the Defense, High-Tech, Retail, Commercial, and Medical industries. Do not hesitate to contact us with any questions or submit your RFQ today. Thank you!